Hello and welcome back! This week I am going to share three cards with you because of two challenges that end in October. The first card is for the Lawnscaping challenge #116 'Too cute to spook'. 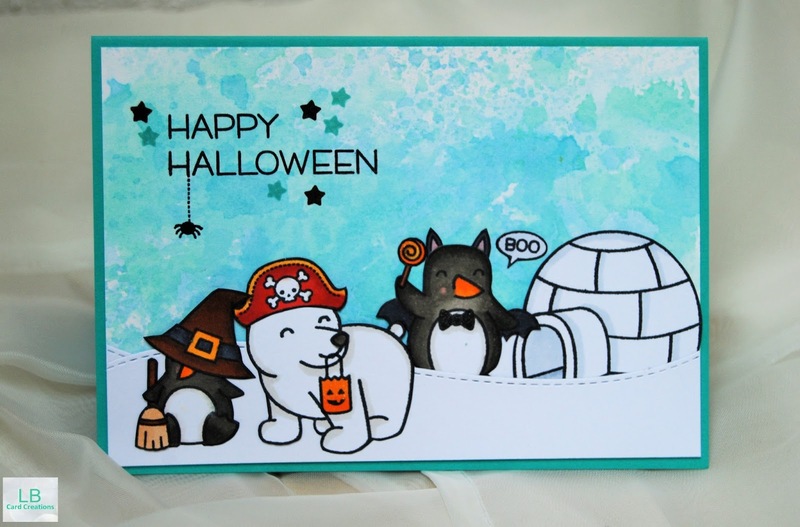 I created a Halloween card with cute winter critters. For this particular project I used 3 distress inks: tumbled glass, broken china and cracked pistacchio. I really like this color combination for winter/snowy scenes!! While letting the color dry I stamped some critters and the igloo from the 'critters in the snow' stamp set from Lawn Fawn. I combined them with some accessories of the newer 'booyah' stamp set. For the coloring I used Copic markers and for some interest I added glitter with the Wink of Stella pen to the accessories. For the snow I diecut white cardstock using the landscape trio dies from Mama Elephant. After cutting out all the elements I adhered them to the background and added the sentiment from the 'booyah' stamp set and some stars with Lawn Fawn dye ink. this is adorable! winter halloween scene..never really thought about that. LBCardCreations. Designbilder von merrymoonmary. Powered by Blogger.